Please upload a picture of image of Drill Hands. The Holey Moley is a Dream Eater that appears in Kingdom Hearts 3D: Dream Drop Distance. It serves as a boss in Country of the Musketeers in Riku's story. The Holey Moley attacks as Riku races to install the Stage Gadget backstage and sabotage a trap Pete has set for Mickey, Donald, and Goofy. It taunts Riku and begins warping around the room; the Keyblade wielder launches a counterattack and defeats the Dream Eater just in time to disable Pete's trap and save his friends. The Holey Moley is a mole-like Dream Eater that resembles an armored knight. It wears an orange and purple helmet, and its red eyes can be seen through square slits. The Holey Moley's nose protrudes from the center of its face, and it has a multicolored tip. This Dream Eater's helmet is held together by gold hinges, and atop its head are two feathers; one is pink and yellow in coloration, while the other is blue and yellow. The undersides of these feathers are lined with yellow spots and have swapped color palettes. The Holey Moley's arms resemble the sleeves worn by French soldiers in the nineteenth century; they have red stripes and "hems." The palms of the Holey Moley's hands are light purple, while the tops of its hands are dark purple and decorated with twin, S-shaped symbols that are orange and yellow and purple and blue, respectively. Each of this Dream Eater's hands have three sharp claws that are turquoise with yellow tips. The Holey Moley's body is mostly black in coloration; the Nightmare Dream Eater emblem appears on the center of its yellow-brown chest and has a rainbow-colored, S-shaped symbol on either side of it. 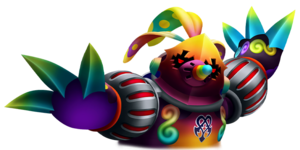 This Dream Eater's English and Japanese names are derived from "Hole Mole" (穴土竜, Ana Mogura?) and refer to the real-world mole's propensity for burrowing. The English name is also a double entendre on "holy moley," an expression of surprise. The Holey Moley is a hit-and-run fighter that uses its claws to deal damage and then escapes to another part of the battlefield via a "warp hole." Riku can use Flowmotion attacks to deal quick damage to this Dream Eater, and to compensate for his inability to use Reality Shifts against it, he can use warping attacks of his own, such as Dark Aura and the Ghost Drive Dual Link. Ice Barrage is a useful command to use against the Holey Moley, as it can strike the boss even at a distance. It is important to always Lock-On to the Holey Moley in order to track its movements. Once half of its health has been depleted, the Holey Moley will disappear and send its hands through multiple warp holes to attack for a short period, then reappear afterward. Once it is down to one HP gauge, it will become more aggressive in its attacks.